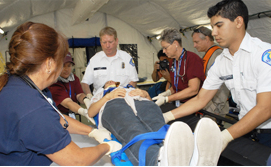 The State of California Emergency Medical Services Authority (EMSA) is strongly committed to protecting the privacy of registrants of the Disaster Healthcare Volunteers Site (Site) to the extent allowable under applicable California law. EMSA wants to contribute to providing a safe and secure environment for our users. In general, this Site automatically gathers certain usage information, such as the number and frequency of visitors to the Site. EMSA only uses such data in the aggregate. This aggregate data helps EMSA determine how much certain parts of the Site are used so that EMSA can improve the Site and assure that it is as appealing as it can be for as many users as possible. The Site uses a technology called "cookies" that tells EMSA how and when pages in the Site are visited and by how many users. EMSA may partner with other organizations (such as professional associations) to recruit volunteers through those organization's websites. In such cases, EMSA may provide aggregate statistical information to those partnering organizations to indicate how many volunteers were recruited via partner websites. This reporting is entirely statistical (e.g., how many volunteers were recruited), not lists of names of specific volunteers solicited at a given partner's site. Most browsers are initially set up to accept "cookies." You can reset your browser to refuse all "cookies" or to indicate when a "cookie" is being sent. 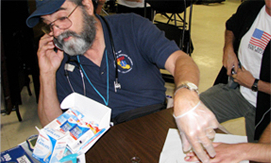 When registering on the Site as a volunteer health professional in the Disaster Healthcare Volunteers System, volunteer registrants agree to provide certain personal identifying information and professional credentialing information (collectively, Registration Information). EMSA collects, uses and maintains this Registration Information in implementing the Disaster Healthcare Volunteers System. EMSA does not use the Registration Information provided by volunteer registrants to the Site except to the extent described in the Site's Terms of Service. EMSA does not disclose any Registration Information provided by volunteer registrants to the Site except to the extent that such disclosure is required pursuant to a California Public Records Act request (Government Code sections 6250, et seq.) Disclosure of highly sensitive personal information will only be done in accordance with the California Information Practices Act (Civil Code 1798.24), and any other relevant state or federal laws. Additionally, as described above, EMSA may share aggregated statistical "ratings" information about the use of this Site with Web site partners.